Tsepun is a Tibetan word for "long life." It's a common name for males in Nepal and the Khumbu. 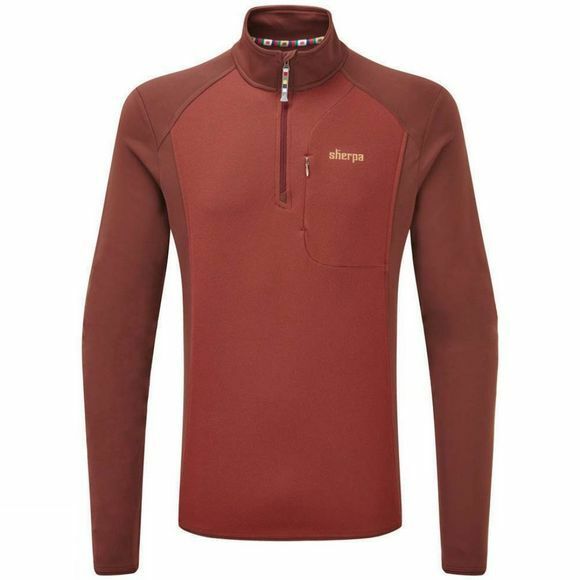 The Mens Tsepun Zip Tee from Sherpa has an incredibly speedy moisture wicking ability and dries ultra fast if it gets wet. Made of Sherpa Adventure Gear's own state-of-the-art Dry Zone fabric, featuring a smooth interior for easy on/off over base layers, and a soft outer layer which increases thermal qualities when worn in a layering system. Bottom line: you stay warm and dry as you move, so it makes a fantastic non-bulky layering piece for hiking, biking and running.